In 1991 I was a recovering rock musician and only just discovering that folk music, like the kind we used to sing around the campfire at summer camp, still existed. I got invited to a weekend conference/retreat by something called the People's Music Network. When I called for more information - where do you stay, how do you get there - the person who answered the phone was Sonny Ochs, sister of the guy who wrote "Draft Dodger Rag," one of the songs my camp counselors all sang. I decided to go. When I got there I discovered that another PMN member was the guy who wrote "Where Have All the Flowers Gone" - Pete Seeger. I have stayed involved with the People's Music Network ever since, and got to see Pete once or twice a year at PMN gatherings, not just onstage (changing the last line of "Somewhere Over the Rainbow" to 'why can't you and I' to make it more inclusive) but in workshops of maybe a dozen people sitting in a circle hearing him talk about how to structure a set (always follow a challenging, potentially divisive song with a one that will unite people) and having him listen and comment on other people's songs. And, maybe most importantly, I got to see the way Pete - arguably the most influential American folksinger of the twentieth century - was always one of the group, stacking chairs and sweeping the mess hall floor with the rest of us. Pretty humbling and eye-opening to witness, especially for a former future rock star like me. 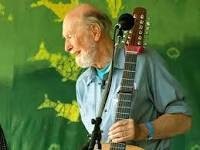 As I've learned more about folk music, it's been amazing to realize the scope of Pete Seeger's career (from The Almanac Singers with Woody Guthrie, to the Weavers, to being blacklisted, to singing at Barack Obama's inauguration) and his contributions to what we know as folk music - composing, adapting, discovering and/or popularizing songs from "Michael Row the Boat Ashore" to "We Shall Overcome" to "Wimoweh" to "Rainbow Race." And all the while, never forgetting the people who sweep up the concert hall after the crowd has gone home. This Saturday evening March 29 I'll be performing at the People's Voice Cafe in New York City, along with Pat Lamanna and Mara Levine & Caroline Cutroneo, and we'll be closing the evening with Pete's song "Where Have All the Flowers Gone," the first song of his I ever learned, at summer camp. My camp didn't know it was a Pete Seeger song, they just thought it was a folk song. Exactly. The next afternoon March 30 Mara and I will singing, along with Loretta Hagen, at the St. John's Gallery in Easton, PA, near where I went to camp. When we do "Where Have All the Flowers Gone" I'm sure some camp friends will join in. Thanks, Pete. Then on Saturday April 5 I'll sing it one more time, with Dean Stevens, as the Nameless Coffeehouse in Cambridge, MA celebrates Pete's life and music. Many of Boston's finest folksingers will be there, and I'm honored to be among them. Thanks again, Pete, for everything.